Which Of These Sweet Treats Was Originally Made From Sap? When it comes to crossovers of well-known fiction characters, there’s no shortage of fan fiction that cross-links everyone from Luke Skywalker to Commander Riker and everyone in between, but official works that link major characters in cross-universe ways are pretty rare. 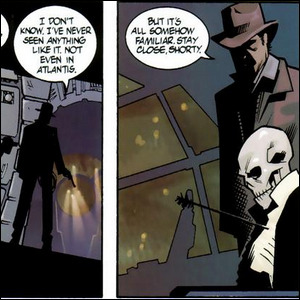 One peculiar example of such cross-linking occurs in a 2004 comic book story, “Into the Great Unknown” by W. Haden Blackman, that was included in Star Wars Tales 19. The officially sanctioned (but not canonical to either linked story universe) tale involves the only known crossover appearance of Han Solo and Indiana Jones—a crossover appearance made extra notable since the two iconic characters were played by the same actor, Harrison Ford. The basic plot of the story, and forgive us for spoiling it in the name of thoroughness, is that Han Solo and Chewbacca end up, as the result of a blind hyperspace jump, crashing into ancient Earth wherein they are attacked (and Han Solo is killed) by Native Americans. Chewbacca escapes, and in the process, becomes the kernel for the myth of Sasquatch. 126 years later, Indiana Jones is in the area searching for the origins of Sasquatch and finds the remains of the Millennium Falcon, along with the skeleton of Han Solo. Image courtesy of Blackman/Dark Horse Comics.